Chromium participates in glucose metabolism by enhancing the effects of insulin, the pancreatic hormone that provides cells with glucose for energy and maintains normal blood glucose levels. Chromium also influences protein and fat metabolism. ChromeMate®, a unique oxygen-coordinated niacin-bound form of chromium, has been shown to promote healthy lipid profiles and glucose metabolism in animals and humans. In the present double-blind clinical investigation, 2 groups of volunteers received either 300 micrograms of ChromeMate® or a placebo daily for 3 months. The supplement significantly lowered fasting glucose levels, which remained unchanged in the placebo group. The chromium supplemented group also experienced modest decreases in triglyceride levels and glycosylated hemoglobin, an accurate measure of long-term glucose control. The results of previous acute and sub-chronic toxicity studies as well as standard skin and eye irritation tests in animals, indicate that ChromeMate® is a safe compound for humans. These findings support the use of ChromeMate® to safely improve altered glucose and lipid metabolism in those with inadequate chromium. Source: Bagchi M, Jensen N, Preuss HG, Bagchi D, Efficacy and Toxicological Assessment of a Novel, Niacin-Bound Chromium in Ameliorating Metabolic Disorders, 10th International Congress of Toxicology-Finland 197:abs. 354, July 2004. 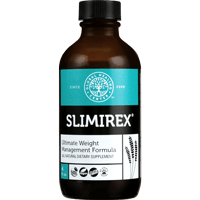 Slimirex® is the only advanced weight management formula in the world combining 10 proven fat-fighting and appetite suppressing nutrients in every dose. Information and statements made are for education purposes and are not intended to replace the advice of your treating doctor. Global Healing Center does not dispense medical advice, prescribe, or diagnose illness. We design and recommend individual nutritional programs and supplements that allow the body to rebuild and heal itself. The views and nutritional advice expressed by Global Healing Center are not intended to be a substitute for conventional medical service. If you have a severe medical condition, see your physician of choice. This Web site contains links to Web sites operated by other parties. Such links are provided for your convenience and reference only. We are not responsible for the content or products of any linked site or any link contained in a linked site.